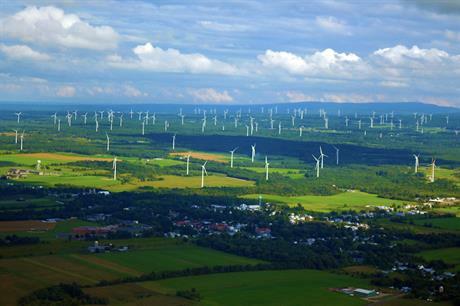 UNITED STATES: Global asset manager the Carlyle Group has entered the wind power market by establishing a new subsidiary and acquiring a 612MW portfolio in New York state. Its newly created affiliate Zephyr Wind Energy will acquire six projects in northern and western New York from wind developer Noble Environmental Power. The transaction is subject to customary conditions, including regulatory approvals, and is expected to close in the fourth quarter of 2018. Financial terms of the acquisition have not been disclosed. And the 106.5MW Chateaugay project in Franklin county in the north of the state. Matt O’Connor, the investment group’s managing director and the head of Carlyle Power Partners, said: "We are excited to acquire this platform, which brings important diversification to [our] portfolio." The acquisition will increase Carlyle Power Partners’ portfolio to a net capacity of approximately 7GW, the group said. Its power portfolio currently consists of natural gas-fired cycle power plants and coal stoker-fired boiler power facilities in the United States. The company has also previously invested in, and then sold, solar PV projects. Noble Environmental Power also owns the 114MW Great Plains wind farm in Texas.